Beit Shearim is one of the most famous sites in Israel, due to its remarkable necropolis, where a series of catacombs were excavated in the hill side . In the picture below is one of the decorated sarcophags (coffin). 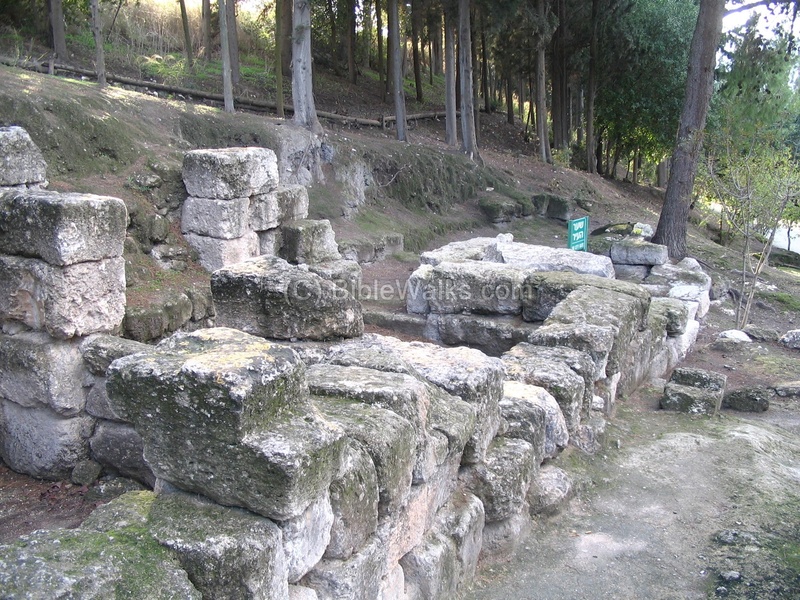 Beit Shearim (Besara) was a Hellenistic and Roman city, one of the most important in the area. During the Jewish revolt against the Romans, it was one of the bases for the commander, Josephus Flavius. Beit Shearim is a famous archaeological site, due to its remarkable necropolis, where a series of catacombs were excavated in the hill side . In the man-made tunnels and caves there are hundreds of coffins dated to the 2nd C - 5Th C AD. These tombs were of rich Jewish families from many countries around Israel who requested to be buried in the Land of Israel, close to Rabbi Yehuda Hannasi whose tomb is located in one of the tomb clusters. The catacombs were declared a UNESCO World Heritage site in July 2015. 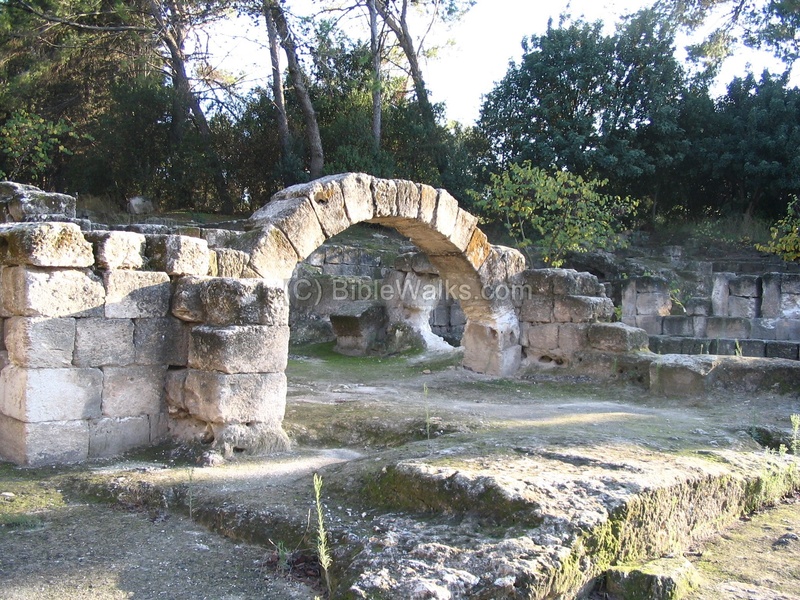 The ruins of the village are located in the south side of Tivon, a city on the road from Haifa to Nazareth. A Kibbutz with the same name, Beit Shearim, is located 5 KM to the east. 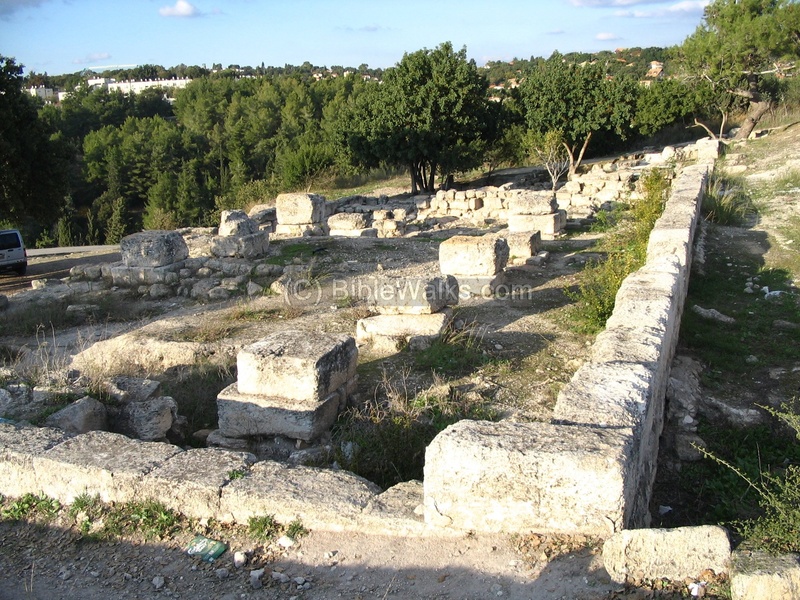 It may confuse you if you are driving from Nazareth, but the ancient site is located south to the city of Tivon. It can be reached either from the north from Tivon, or from Sede Yaakov. There are 2 sections in Beit Shearim: the ruins of the Roman city are located on the top side, while the catacombs are located on the hillside below the hill. The catacombs are within a national park, secured behind gates, and you need to pay for the admission and visit the caves only within daytime hours. The following aerial view shows the points of interest. You can point on the purple points to navigate to the selected point. The city was first inhabited in the 9th C BC. It was established during the Persian period (4-5C BC) and the Hellenistic period (4-3C BC). It was probably a continuation of the Biblical site to the south, Tell Kassis (Biblical Khelkat? ), 2KM south west. It was mentioned by Josephus Flavius, who described his actions during the revolt against the Romans (67/68 AD). He did not fortify the city, but confiscated the corn that was stored in the city and belonged to the sister of Agrippas II (see references below). The city reached its peak during the 2nd and 3rd C AD, and for some time it hosted the Sanhedrin (supreme judicial body during and shortly after the Second Temple period) . After the chief of the Sanhedrin, Yehuda Hannasi, was buried in the hillside, the city became famous and many rich families buried their dead in the rock-cut necropolis. The city was destroyed by the Roman legions during the Gallus revolt (351/2 AD). It did not recover this destruction, and remained a small village. 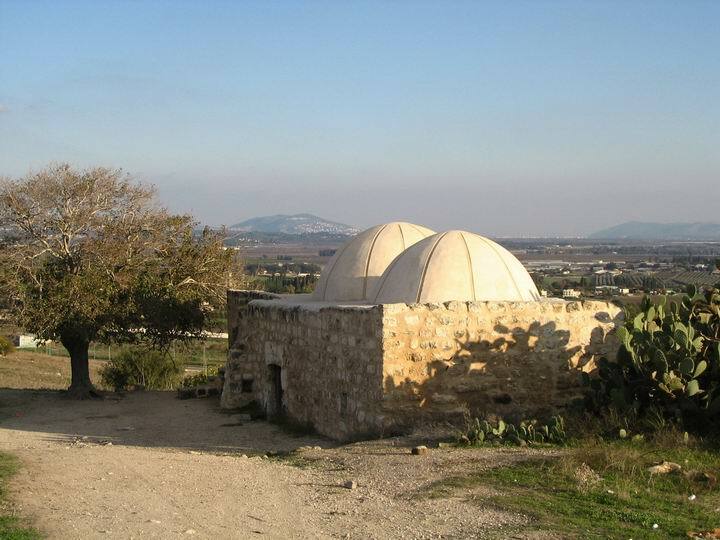 In the 19th C a small Arab village, Sheik Ibrik, was located on the hill, named after the tomb of the Sheik. An aerial view, captured by a quadcopter drone from the south-west side, shows the hill on which the ruins of the ancient city are located. The ancient city of Beit Shearim (Besara) is located on the summit, and was only partially excavated to date. It is open to the public, offering great views of the area. On the left (north) corner in the background is the location of the national park of Beit Shearim, with its famous catacombs. On the right is a new section of the catacombs. The main entrance to the city was located on the eastern side of the city. 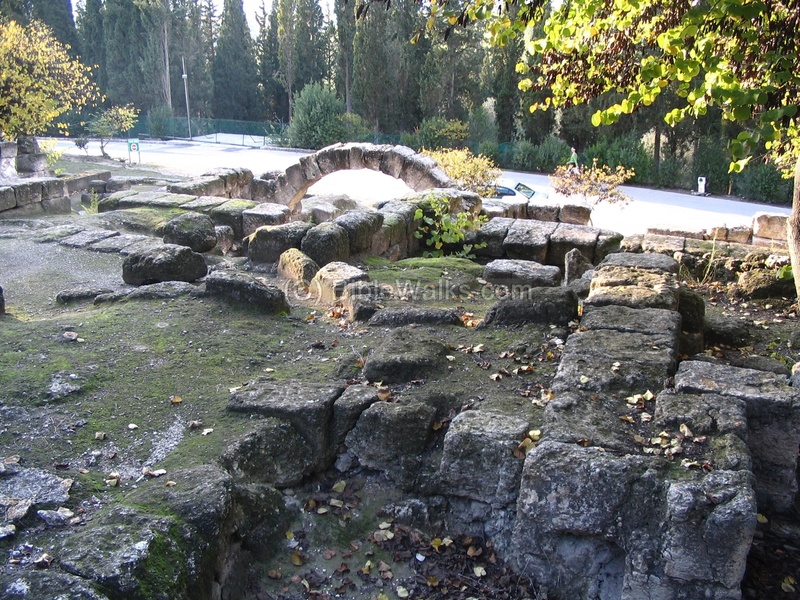 Remains of the city gate are as seen below. 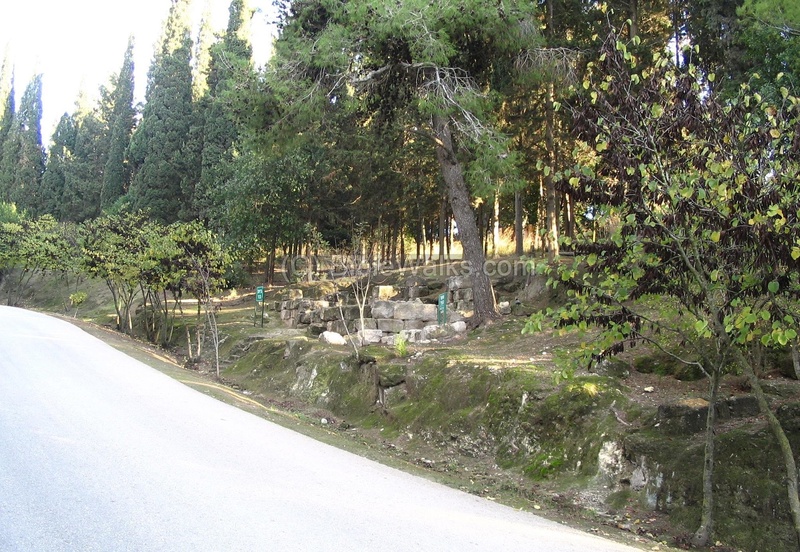 Most of the city is covered under the forest and the grounds around the hill, and was not yet excavated. The next photo offers another view of the city gate. A stone paved road lead from the gate into the city. The city's income relied on agriculture (wheat, corn, olives and grapes) and later added grave digging (constructing the catacombs). 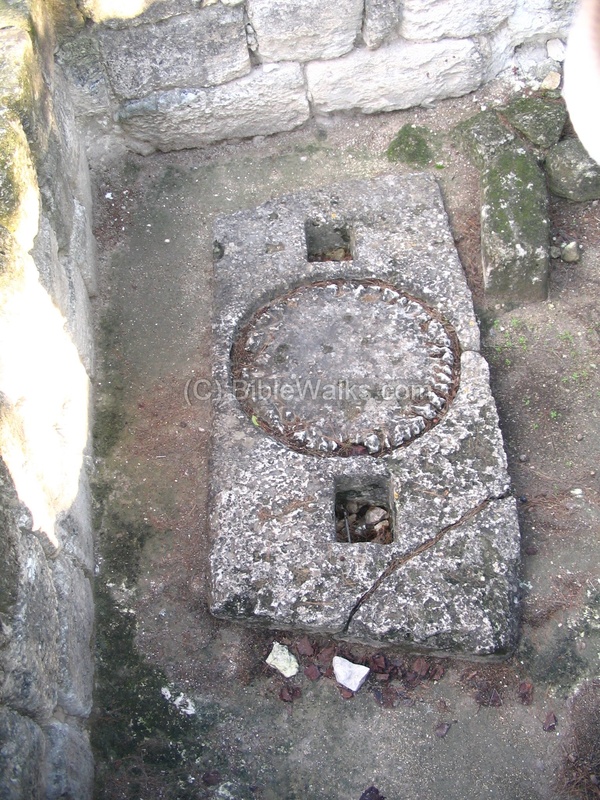 Adjacent to the city gate are the remains of an oil press, seen below. In the base of the oil press the olives were placed in bags on top of the base, and a heavy stone pressed from above, crushing the olives, and squashing out the oil extract through the small groove on the right side, and flowed into a jar. Near the entrance of the ancient city stood the synagogue. In the photo below is the front side of the compound of the synagogue. From here the worshippers walked down the stairs into the Necropolis - the array of catacombs that lie just under this area on the hillside. The synagogue was 35 x 15M, and its entrance faces south (towards Jerusalem). 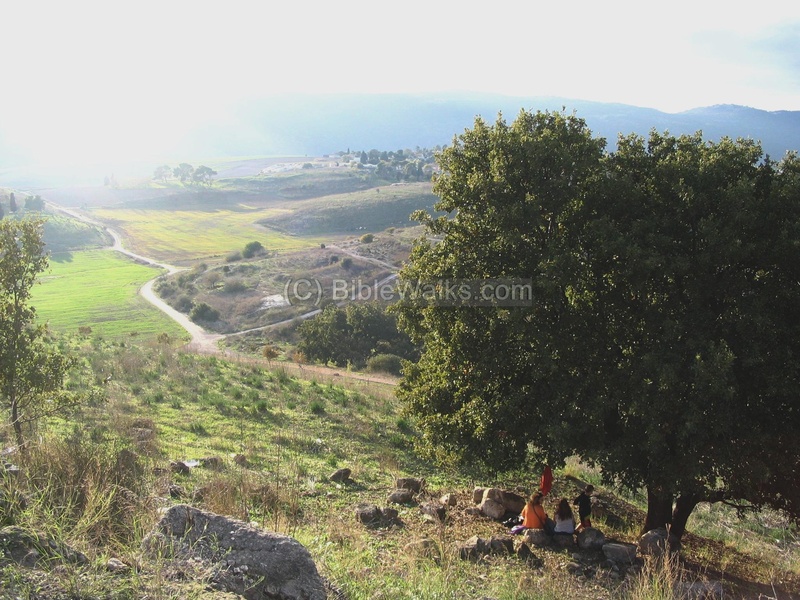 On the west side of the ancient city is a nice view of the area, with the low hills of the town of Tivon around it and mount Carmel in the background. Families, as seen below, come here for a stroll and picnic to enjoy the scenery. The view of the rolling hills, the bathing sun in this winter Sabbath, and the feel of history that engulfs you - are indeed one of the true treasures in Israel. Near this side are some of the Roman city excavations, including this large Basilica-type public house. It was built in the end of 2nd C AD, at the times of Yehuda Hannasi, above an earlier Hellenistic layer. Some scholars suggest this was the place of the Sanhedrin (thanks to Danny the Digger for this note). Its western side, above the hill side, was the external wall of the city. Under this building are cisterns that accumulated the water from the roof. It was destroyed in 351/2 during the limited revolt of the Galilean Jews against Rome, during the times of Gallus Caesar, cousin of Constantius II (son of Constantine). On the top of the hill, in the center of the ancient city, is a modern bronze statue of Alexander Zaid riding on a horse and watching the valley of Jezreel below it. Alexander Zaid was a farmer and a security guard for the Jewish lands around the area, and one of the founders of "Hashomer" (Hebrew - the protector). He was murdered in an ambush nearby during one of his patrols (1938). His sons and friends revenged his death and killed the Arab assassin. Zaid's house is located here and his family continues to work in the farm. 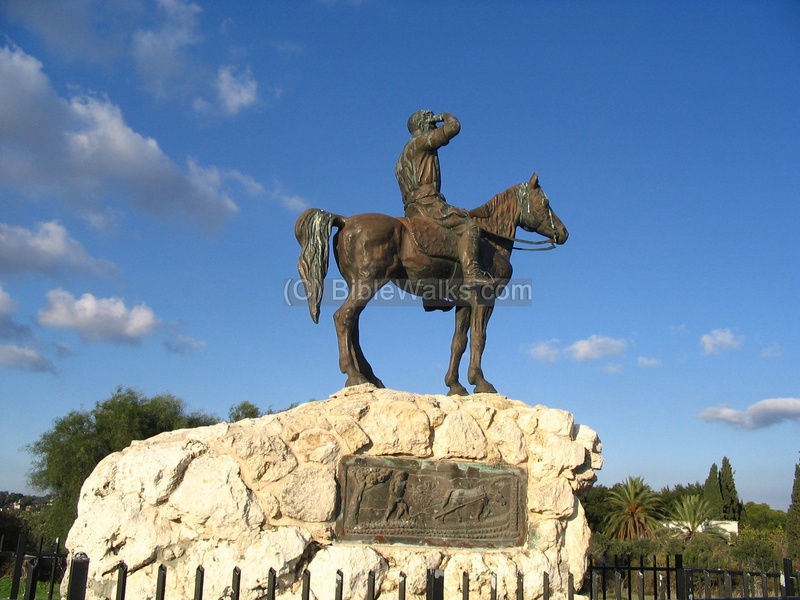 Near Zaid's statue is a Sheik's Holy tomb, called Sheik Ibrik. The tomb is located on the eastern edge of Tel Beit Shearim, overlooking the valley of Jezreel. In the center of the far background is Mount Tabor, and Nazareth is to its left side. It is not clear who is buried here, but the name (Ibrik means vase) is according to an Arab Tradition associated with a legend about a believer who frequently washed his hands with water in the pitcher. Based on the legend, many sick people came here to pray and wash in the spring south-east to the tomb. You can climb on the roof and enjoy the fascinating view of the valley below. In the background of this photo is Givat Hamoreh in the center (where Naim is located), and Giboa mountain on the right (where King Saul was killed). According to new traditions, this tomb is named after Barak the son of Abinoam, the Biblical military hero who defeated Sisera during the times of Judge Deborah (Judges 4 & 5). His victory was in the fields and hills nearby (4:16: "But Barak pursued after the chariots, and after the host, unto Harosheth of the Gentiles: and all the host of Sisera fell upon the edge of the sword; and there was not a man left"). 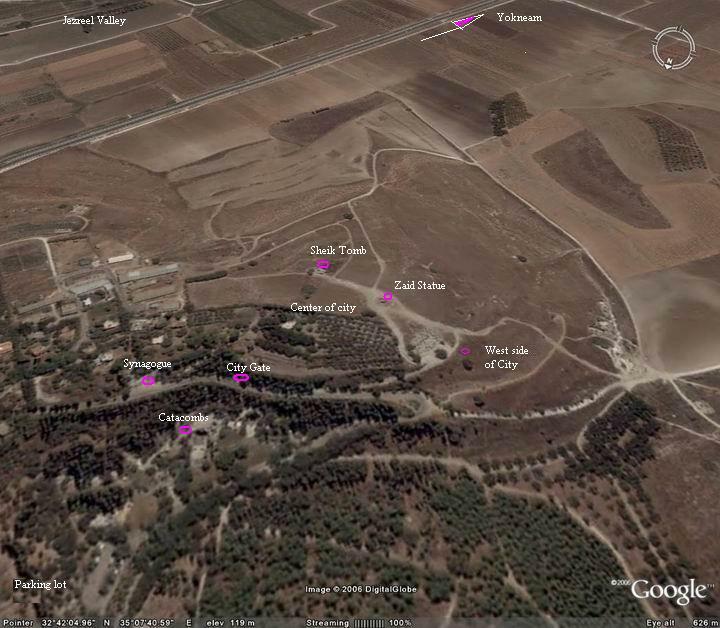 Note that "Harosheth of the Gentiles" is identified in the site nearby called Geva-shemen, located on the banks of the Kishon River. Beit-Shearim is a large necropolis, and its famous catacombs dot the hillside under the city. This is detailed in another page. Josephus, the Roman era Jewish historian, was previously the commander of the Galilean Jews against the Romans. In this text the Commander talks about his acts during the preparations to the revolt (66-67AD). He describes the range from Gibea (Geva) to Beit-Shearim (Besara) - 20 furlongs (4KM). This description, in addition with archaeological excavations and a tablet that was found here, provides an absolute identification of the site. "Now king Agrippa sent an army to make themselves masters of the citadel of Gamala, and over it Equieulus Modius; but the forces that were sent were not allow to encompass the citadel quite round, but lay before it in the open places, and besieged it. But when Ebutius the decurion, who was intrusted with the government of the great plain, heard that I was at Simonias, a village situated in the confines of Galilee, and was distant from him sixty furlongs, he took a hundred horsemen that were with him by night, and a certain number of footmen, about two hundred, and brought the inhabitants of the city Gibea along with him as auxiliaries, and marched in the night, and came to the village where I abode. Upon this I pitched my camp over against him, which had a great number of forces in it: but Ebutius tried to draw us down into the plain, as greatly depending upon his horsemen; but we would not come down; for when I was satisfied of the advantage that his horse would have if we came down into the plain, while we were all footmen, I resolved to join battle with the enemy where I was. Now Ebutius and his party made a courageous opposition for some time; but when he saw that his horse were useless to him in that place, he retired back to the city Gibea, having lost three of his men in the fight. So I followed him directy with two thousand armed men; and when I was at the city Besara, that lay in the confines of Ptolemais, but twenty furlongs from Gibea, where Ebutius abode, I placed my armed men on the outside of the village, and gave orders that they should guard the passes with great care, that the enemy might not disturb us until we should have carried off the corn, a great quantity of which lay there: it belonged to Bernice the queen, and had been gathered together out of the neighboring villages into Besara; so I loaded my camels and asses, a great number of which I had brought along with me, and sent the corn into Galilee. When I had done this, I offered Ebutius battle; but when he would not accept of the offer, for he was terrified at our readiness and courage, I altered my route, and marched towards Neopolitanus, because I had heard that the country about Tiberias was laid waste by him. This Neopolitanus was captain of a troop of horse, and had the custody of Scythopolis intrusted to his care by the enemy; and when I had hindered him from doing any further mischief to Tiberias, I set myself to make provision for the affairs of Galilee". Beit Shearim - In Hebrew: Beit or Beth (house), Shearim (Gates) = House of the gates. Sheik Ibrik - In Arabic: Sheik (chief), Ibrik (vase). Tiv'on (Tivon) - The name of the modern city where Beit-Shearim is located. It is based on the Roman village (named Tiv'on, and also Tivin, Tiv-in, Tiviim). In Arabic: Tab'un. The source of the name (as per Z. Vilani) may be from the root name Tava (drowned in Hebrew), since the ground is swampy after rain.